W e support wholesale. hope you will wait for item Patiently! It depends on your exact location. Maggie will give you the best solution. The color of the website's photo and the actual item could be slightly different. Vertical pin and clasp on the back. Type: Rfid. 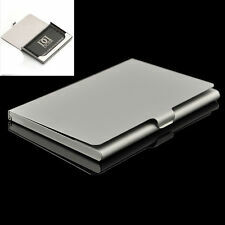 1 pc rfid ID card Holder. Style:ID Wallet. Protect your ID card, Credit card, Bank card. Item Specific Fit for:Credit card/Bank card. Prevents strangers reading your card. Back of case is stamped: Frank Lloyd Wright Fnd. New in original box, wrapped in tissue in a black pouch that is also a polishing cloth. Jog the button and cards will slide out automatically. Material: stainless steel. I sincerely hope that you’ll understand the cause. Durable, easy to carry. Can also be used for holding credit cards and ID cards. Material:Stainless steel. They may need your phone number to call you to pick it up. Width Height Thickness:5.5 2 0.08cm. 1 Piece x Credit Card Holder. - Easy to Carry, Best Size to Put in your front / back pocket. - Security latch locks up tight to keep your cards safe from water, weather & scanning thieves! The product is new, never used and in good conditon, just go ahead and buy! Surface Waterproof. Material: Stainless iron. 1 X Card Case Box. Interior Material: ABS Plastic. (2) Shields RFID readers and scanners from accessing the RFID chip embedded in modern credit and identification cards. 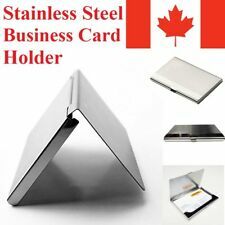 Credit Card Passport Protector RFID Blocking Case Sleeve Shield Holder Secure. 5x RFID Passport Sleeve.